Overview: Eagles Nest Outfitters started with two brothers wanting to enjoy a laid-back lifestyle. They decided to start making hammocks out of their van, and now ENO is one of the most popular hammock manufactures. 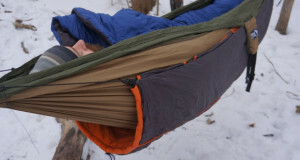 This ENO Hammocks Ember 2 Hammock Under Quilt is the most affordable under quilt on the market, but it holds up in toughness to much pricier under quilts. What Makes It Unique: The ENO Hammocks Ember 2 Under Quilt was meant to keep you warm in Fall and light winter conditions. Rated down to 40 degrees this under quilt is made of a great nylon ripstop material with a DWR finish. This makes the under quilt something you can trust knowing it will hold up to the elements. 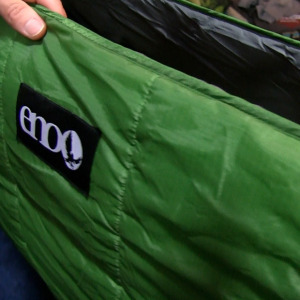 As with all ENO products the Ember 2 Under Quilt is easy to use. It is held up by a simple bungee suspension system that attaches to a carabiner, this allows for easy set up, break down and adjusting. 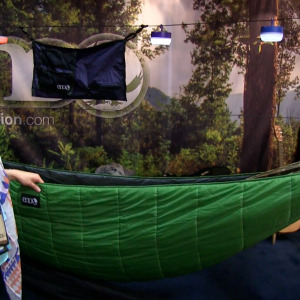 This underquilt has a hammock specific cut and is great for those colder nights camping.